The conventional wisdom is that living in the city is much more expensive than living outside of it. Taxes, entertainment, and groceries all add up to a slightly higher cost of living in the city. Housing, though, is the expense that tips the scales decidedly in favor of the suburbs. Or does it? With car payments and car costs at their highest levels ever, transportation costs can rebalance the scales in favor of the city. Unfortunately, most people don’t consider the cost of transportation when deciding where to live. So let’s do a hypothetical apartment search. Craigslist, fortunately, makes this fairly easy. It also paints a picture of the vastly different housing costs in a region. In the Washington D.C. area, for instance, you can rent a nice $1,695 per month one-bedroom apartment in bustling Dupont Circle or a comparable $1,000 per month one-bedroom house in Dumfries, Virginia. The primary reason for this 69 percent premium inside the District: location. The data bears out these housing-cost differences in other major cities as well. From San Francisco to Boston, rents are often significantly higher in the urban core than in their neighboring, car-dependent, suburbs. This often-dramatic disparity leads many renters to decide to live in the suburbs, and the traditional methodology for deciding housing affordability – that rent amount to no more than 30 percent of income – supports this decision. Not only is this metric becoming increasing irrelevant, but by using it, a lot of people may move precisely where they should not. Thankfully, there’s another tool that accounts for transportation in determining housing affordability. The Center for Neighborhood Technology has shown that location-efficient places (places that are walkable and transit-accessible) can actually be more affordable than location-inefficient (or car-dependent) places. The CNT has created an H+T Affordability Index that compares ZIP codes or addresses to determine the affordability of an area. It uses not only housing costs, but transportation costs, in making this determination. Now let’s consider an actual case, that of my own living situation. I live in one of the more expensive neighborhoods in Washington D.C.: the aforementioned Dupont Circle. My rent is around $1,400 per month for an apartment, and I live on a moderate income. The traditional 30 percent rule would have steered me away from this neighborhood (and towards Dumfries, possibly), predicting I’d be rent-burdened inside the city. The Affordability Index created by the CNT produces different results. Because I don’t own a car, and because Dupont Circle is so walkable and transit-friendly, my housing is actually fairly affordable. This kind of analysis is perhaps even more important in today’s economy. Car prices, and car payments, are higher than ever. The average new car price is more than $33,000 (according to the Kelley Blue Book), or around $600 per month for a traditional five-year loan. Tack on gas, car insurance, and maintenance, and the cost of this new automobile realistically adds up to $750 per month or more. On the other hand, I do not own a car. I spend around $160 per month on Metro and Circulator fares, plus less than $10 on Capital Bikeshare. I splurge on Uber to the tune of about $80 a month, and use Zipcar only rarely. $250 in the city for transportation costs versus $750 in the suburbs is a pretty big difference. The cost of the two Craigslist apartments at the beginning of this story now seem more comparable, and my actual rent in the city looks downright reasonable. I am sensitive, though, that when it comes to working-class families, the previous comparisons may not have the same validity. Housing remains a burden for lower-wage households, and one in four American households spend half of their income on rent (plus utilities), according to an analysis of Census data by Enterprise Community Partners. The cost of transportation for larger households is more problematic in the city because transit fares have to be purchased by each family member, whereas a car costs the same whether there is one or six people in it. In recognition of these issues, the Affordability Index works best for moderate- to high-income households. Rent-burdened households face challenges that may not be alleviated by moving into the urban core. That said, they probably won’t be much easier in the suburbs, either. Family size, children, and personal preferences for land and privacy versus vibrancy and nightlife will all factor into these decisions as well. 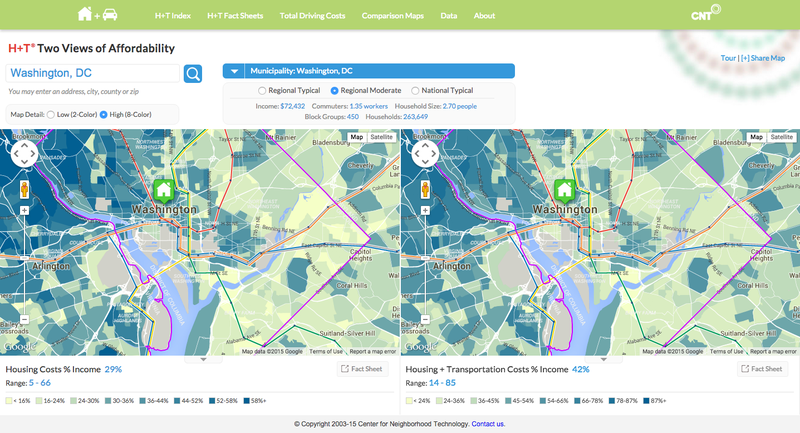 Transportation, though, remains the hidden cost in the housing equation that all households should consider. Question my calculations? Want to share your own personal experience? I’d love to hear from you. Splash aerial photo by the author. 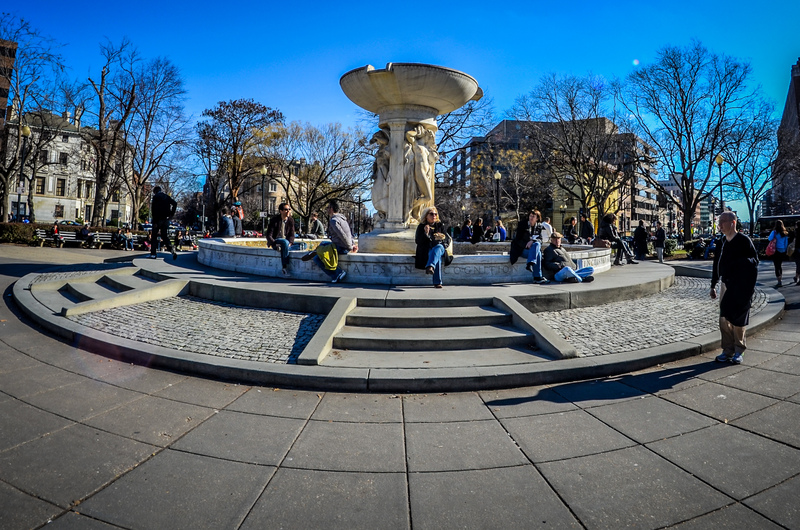 Dupont Circle fountain photo by Flickr User m01229. Dupont Circle bus photo by the author.